The store will open on July 11 at 23-19 Steinway St., selling new and used records. 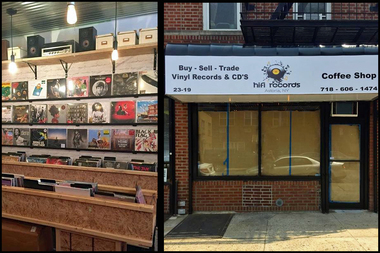 ASTORIA — The neighborhood's only record store, which will also double as a cafe, will open its doors this weekend, according to the owner. Javi Velazquez, 44, a self-proclaimed "avid music lover" will open HiFi Records at 23-19 Steinway St. on Saturday, with a collection of new and used vinyl. "The other record stores are pretty much all in Brooklyn or the city," said Velazquez, an Astoria resident and project manager by day who said he's long dreamed of opening his own record store in the neighborhood. "I grew up working in record stores," he said, adding that he paid his way through college working in audio shops and fixing record players. "It's always been a a part of my life." He decided to open his own space now, citing a recent resurgence in the popularity of records. "There was always a big following for vinyl — it never went away," he said. "It's just a better way to connect to the music and with the artist's true intention." HiFi will sell both new and used records that span an array of genres, from metal to jazz, featuring household names like The Beatles and Fleetwood Mac to more obscure musicians. "We have the gamut — we have the indie rock, we have the indie pop," Velazquez said. "We have a very, very good collection of eclectic albums." There will be $1, $3 and $5 record bins to browse, as well as newly released albums. There will also be used CDs for sale, and turntables made by U-Turn for those looking to buy a record player. The shop will also include a cafe, serving coffee, cappuccinos, espresso and other drinks that customers can sip on while they shop. Velazquez plans on having listening stations with headphones so patrons can listen to albums before they buy, and also wants to host weekly or monthly open mic and live music events to spotlight local musicians. "Our focus is promoting and educating people about the local music scene here in New York," he said. There will be a grand opening party Saturday at the shop from 2 to 8 p.m., which will feature live music from Queens indie rock band The Gantry, plus performances by Negative Death, Bria Monét and DJ Jay Kinard. The party is being co-hosted by local blog We Heart Astoria, which first reported the store's opening, and will feature free food from Turkish restaurant Truva.